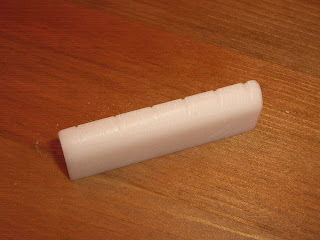 I recently mentioned to a friend of mine that I was thinking of making a new nut for my acoustic guitar, and he generously donated a couple of nut blanks. One is ebony and the other is Corian. 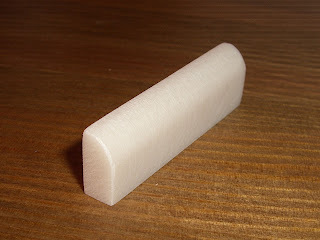 I will use the ebony one to make the new standard nut (which will no doubt be covered in a future blog entry), but decided to make a raised nut with the Corian for when I want to play slide guitar. One of the bonuses of a raised nut for playing slide guitar is that it will be flat, rather than radiused, so no need to work out exact curvature, etc., and since it will be raised off the fretboard, there is no need to worry about precise height measurements. That coupled with the fact that it is Corian should make this a pretty easy project. My guitar neck is pretty thin (just how I like it). It measures a little under an inch and three quarters. One and eleven sixteenths would probably be more accurate. 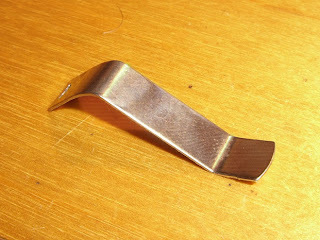 The nut for playing slide was going to be cut a little wider – something like one and seven eighths. 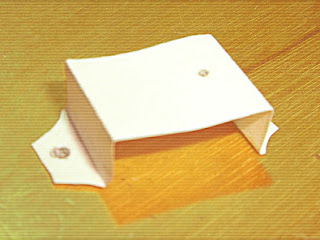 It would stick out a little on each side, but this is OK.
First thing was to cut it roughly to shape. It was just a little too thick, but I would deal with that later. As for the length, well, I had to cut about three eighths of an inch off with a hacksaw. I didn’t feel the need to take a photo of this. 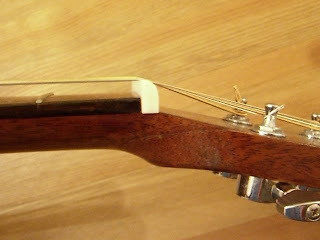 Next was to file a curve onto the top, so that the strings fall away on the head side of the nut. 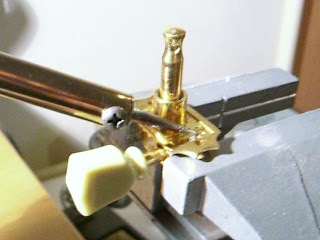 Unfortunately my vice isn’t the best, so I needed to do the filing in the way that is pictured here, one half at a time. This method puts the nut at risk when you lean on it with the file, as it could easily snap in half, so be very careful if you do it this way, and support the back of the nut with your finger. 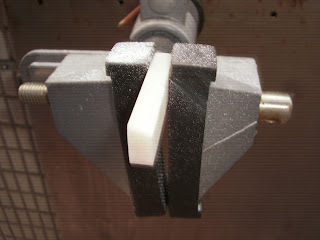 If you have a better vice that can grip the full length of the nut while you work on it, then that’s a better solution. As previously mentioned, the nut was just a little bit too thick, so I solved this by rubbing it on a piece of sandpaper, which was lying on a flat tile. This is a commonly-used and very effective solution. 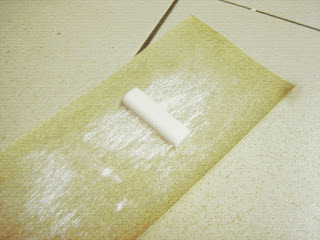 I also used the sandpaper to help finish rounding off the top curve a little bit too. Next thing was to file the nut slots. This can be quite intimidating, but the secret is a good set of nut files and a bit of reading (of course practice makes perfect too). I highly recommend checking out http://www.frets.com for information on this type of thing. 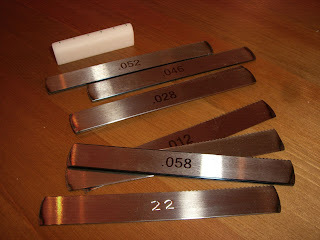 I recently bought a set of nut files called “Norman Guitar Nut File System”. They’re made by a guy called Norman Trent and he mostly sells them on ebay. He has excellent feedback, but some Googling suggests that some people are not happy with how long the files stay sharp, or Norman’s customer support. All I can say is that I got my files pretty quick and they worked well on this project. 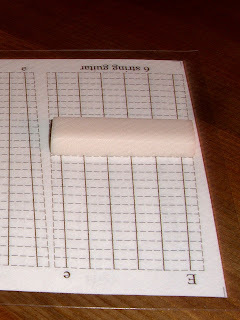 Norman also supplies a handy laminated sheet to help you mark the correct position for the slots, as shown here. Slot positions marked and ready to do some filing. The next step was to actually cut the slots. The depth you cut down should be a little over half of the diameter of the string itself. 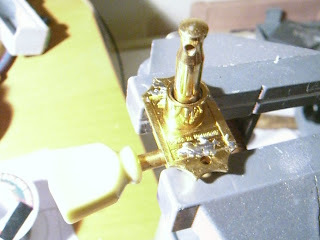 Also, you should file down at an angle so that the slot follows the curve of the top of the nut. This is to make sure the string makes good contact at the very edge of the nut when it meets the fret board and therefore cut out any buzzing, or intonation problems. After the final filing I gave the whole nut a once-over with very thin sandpaper, just to shine it up a bit. Here is the end result. And now here’s the nut on the guitar. It sticks out a little bit at the sides, as planned, and also sits pretty high off the guitar. Now I can really attack that thing with a slide without worrying about banging into the frets. Please note that this post is part three of four posts. I highly recommend reading all four posts in order before acting on any of the information. I tried various different options and finally settled on one that I was very happy with. Ironically, it was the one I thought wouldn’t work – the solder fix. I had already tried the glue repair in the past, but it eventually broke again, so I didn’t even bother trying this time. However, it was going to be my last-resort fix if necessary. Before I show you the solder fix, I should mention that I did try the metal strap solution first. I cut out a little paper template to fit over the tuner and then went hunting for a suitable piece of metal. I really wanted to find a nice little piece of brass, but I found a piece of scrap sprung steel that was just the right size, so I thought I’d try that. However, when I tried to bend it to a 90-degree angle, it snapped. I tried again with a different piece of metal, but the same thing happened. It’s still a possible solution, but you would need to find metal that wasn’t so prone to snapping, or know how to properly heat-treat it. So I ditched the metal strap idea and tried solder instead. I was pleasantly surprised to see that it stuck to the tuner casing EXTREMELY well. So well, in fact, that the test blob I tried on the inside first was a pain to file off. 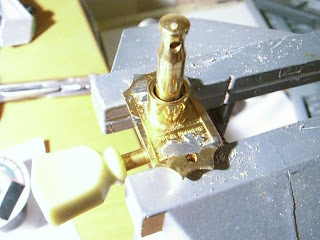 I assembled the tuner and held the back cover in a vice, then heated the join with a soldering iron, as shown here. Now here it is with some solder added. The whole tuner (and vice) acts as a heat sink, so you need to have a powerful enough soldering iron to heat up the area around the join before all the heat gets sucked away (be careful that you don’t accidentally lean the soldering iron against the tuner button, by the way - I nearly did that a couple of times). I used a 40 watt soldering iron, but I’d recommend you use at least 60 watts, if not substantially more. I’d also recommend that you don’t touch the tuner button with your finger (or anything else) until the metal has cooled down again, just in case it has softened up at all. And since I’ve already mentioned waiting, just wait until the whole tuner has cooled down before you touch it. Mine got VERY hot. And don’t blow on the tuner to cool it down quicker either - this is bad for solder joints. Finally, a clean up with a file and we're done! The tuner is now back on the guitar and the fix is completely hidden. A very satisfactory result indeed. EDIT: I've since found out that there is another (known) trick to repairing these tuners, which is to attach the back cover, turn the tuner over and hit the middle of each tab with a punch. This distorts the tab just enough to give it some grip. 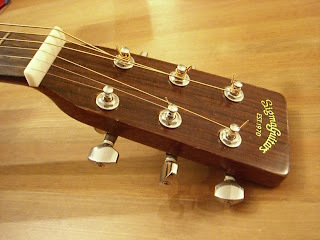 More information here: http://diystrat.blogspot.com/2010/01/gibson-deluxe-tuners-revisit.html.